The latest in our series of dynamic live programming Slone Partners produces in major U.S. healthcare hubs addressed the essentials of corporate culture. 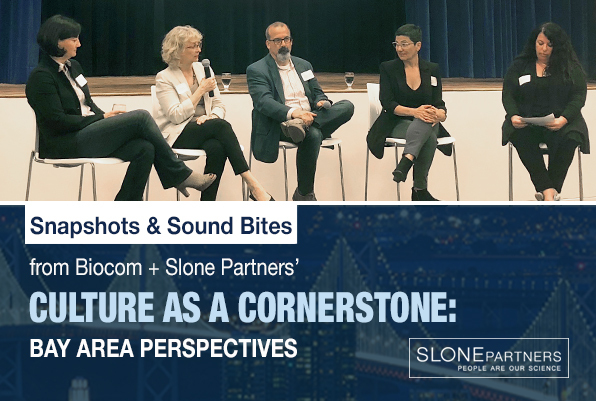 We proudly partnered with Biocom San Francisco July 26, 2018 for INSIGHTS: Culture As A Cornerstone, Bay Area Perspectives, a lively panel discussion which produced a wealth of takeaways for startup, small and midsize healthcare companies. Culture often starts at the top. Culture created from the top down is only successful if all staff are onboard. If those in the middle are not on board, this is where breakdowns can happen. Culture becomes disrupted in the middle, for better or for worse, where it can quickly evolve into something stronger or something unintended or unrecognizable to senior leadership. How many employees does it take for culture to develop? At 125-150 employees, 1:1 connections are possible between everyone, but as companies grow, other ways must develop for culture to thrive. New employees sharing pictures of their lives and fun facts about themselves can bebroadcast on monitors throughout the organization. Context can be added by interspersing photos of their supervisors, so that everyone immediately understands the team the new employee is on. Onsite happy hours and “new hire get togethers” are a great way to introduce new hires to the team. Multiple offices, multiple locations, does geography matter? Founders should make a point to split their time between locations so that employees can see them and be influenced by them equally. It’s important for senior management to get out into the field to embrace remote workers. What office environments are good for morale? Plants and trees, and creating natural environments indoors, are proven to have a positive impact on worker happiness and productivity. Larger organizations are creating more green spaces outside, too. The book Nature Fix is recommended reading. Open work spaces are good for building community and creating a sense of belonging, but different office setups should address and respect the needs of people who work in different ways. How important is gender diversity? Research shows that teams comprised of less than 30% women make women feel as though they can’t be their authentic selves, while 90% of teams that do include a higher percentage of women outperform. Ask the prospective employer what kind of behavior is rewarded, punished, and tolerated for success. It’s important to ask how decisions are made. Ask what kind of people are successful here and who flames out and why. How to keep a positive culture in a growing company? Create opportunities for people to share who they are and what they do. Find ways for people to connect with others beyond their immediate team. Foster leadership, through ambassadors, at every level of the organization. Keep up traditions by implementing cultural journalism. Where does culture start at a company? How to create corporate culture? How to have a successful culture at work? How is gender diversity helpful in corporate culture? Are open floor plans good for company morale and culture? How many people does it take to create positive work culture?